How Important to Back up you Hosting Files? How important to back up you hosting files depends on your preferences for a good web hosting provider. 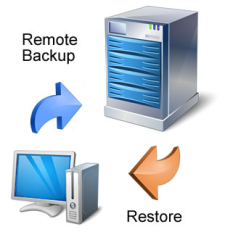 Many hosting companies would include website backups as part of their server package. They also sometimes do free backup or a minimal backup fee, but it is still much important for you to have your own backups, as well. First, you have to backup your hosting files because you have to expect inevitable events. Your service provider could experience technical difficulties or a server crash that could wipeout your data temporarily or permanently. Although this is rare in most cases, it does happen in reality. When you read hosting reviews, take note of the details concerning the provider’s redundant power sources, backup generators and data center. Your web hosting firm remotely monitors all website status on their server. If they noticed that your website is dysfunctional due to any kind of hardware error or system crash, they will take action immediately toward recovery. In most cases, if disaster strikes, your remote storage provider will restore your site to reduce downtime and prevent loss of contents and revenue. Hence, it is really a great option backing up your website data. Second, it is not just the web hosting company that can run into trouble. Your own computer might get stolen, suffer damages or experience a crash. No matter how good your web service provider is, there are cyber crooks (for example, hackers) who might actually break in and wreak great havoc on your website. If you do not save your contents elsewhere, you may lose huge quantities of data. Hence, you have to back-up data on your computer, external hard drive, DVD or subscribe to other online backup service providers. When you use other online backup storage programs/systems, you would be able to save copies of your web-based data. Your backed up information would typically include web contents such as access logs, images, plug-in scripts and databases. So, how important to back up you hosting files depend, on a large part, if you consider using other backup systems as well. Third, you may want to read your service provider’s review details when it does regular backups of your website contents. Is there up-to-the-minute scheduled backups? Or, are backups done daily, weekly, monthly, or only when the company is available? By having regular backup schedules, you ensure the security of all your information and that your web pages are made continuously available to your visitors and customers. Backing up your website is a great solution for restoring any tampered or damaged web page contents quickly. It is thus important to also easily access your backup files whether they are stored by your service provider, on in an external drive located in other remote servers. While there is no assurance how long your web service firm will be in existence, most storage media can last for many years when handled with care and stored properly. Start with website hosting reviews for you to see what your service provider’s offer. Most reputable web hosting companies guarantee data security at their best. So, how important to back up you hosting files is for quick restoration of all your data in case they were corrupted or lost accidentally.